I was surprised by the number of students who completed Lesson 3. Keep up the good work! It keeps me busy. One thing I have noticed about Lesson 3 is that how to measure for gauge can be confusing. This is true for Level 1 of the Masters Program as well. The tip and video next week will be about how to measure for gauge. 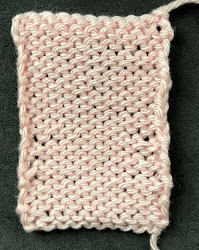 The WORST POSSIBLE method is to knit a few stitches, hold a ruler below them and then count. More about that next week. The tip this week is about how to weave in yarn tails where reverse stockinette is the RS (as in many cable patterns). There aren't any swatches in the Basics class where you need to know how to do this, but it does come up in the Masters Program. 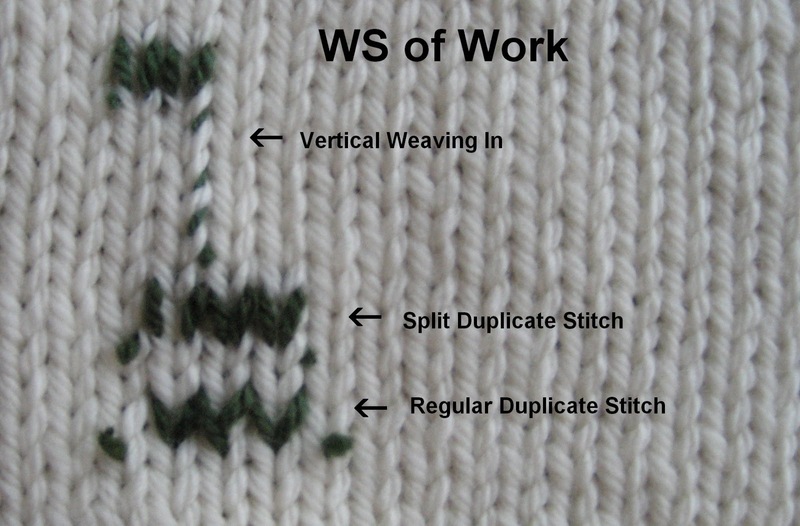 The duplicate stitch method of weaving in ends is recommended in the Basics Course and in the Masters Program and it is ideal where the WS is reverse stockinette. 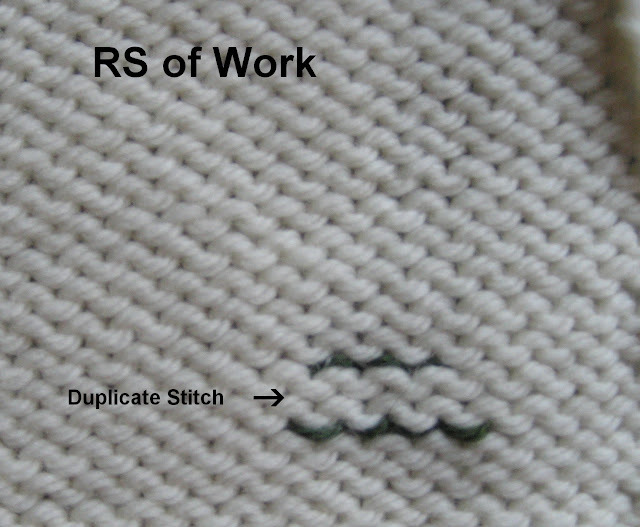 Duplicate stitch to weave in ends is different from the duplicate stitch used as an embroidery technique on the RS. In this technique, you insert your needle and go through to the WS of the work. Obviously, you can't do this for yarn tails. When you use duplicate stitch in stockinette to weave in yarn tails, it is necessary to split the yarn to keep the tail on the WS of the work. The video shows this technique. Sometimes this technique can add quite a bit of bulk to the area. If that is a concern, you can also use the vertical technique you use in ribbing (running the tail up a column of the knit stitches). To make sure the tail doesn't pull free, anchor the tail with a duplicate stitch or two at the top as shown in the photo. Salon this week will be on Saturday from 2-5pm. I am plugging along with the Decoration Day sweater. I generally read while I knit but not with this sweater. I've really had to pay attention. I also switched to Addi Lace Needles after I had stitches slip off the needle. Luckily Magpie Yarns has a very complete selection of needles. Not every yarn store carries many options in 0 (2.00mm) needles. I have divided for the armholes and have finished the fronts. Don't be impressed. The fronts are VERY narrow. There will be a very broad band picked up along the front and neck edges. The color changes give the sweater a striped look and I wanted to break up the horizontal stripes with a vertical on the fronts. My goal is to finish the back this week, block it and get started on the sleeves. I generally work sleeves at the same time but with stranded work, I do them separately. Less yarn management. No, those aren't apron ties. Those are the fronts. They will be wider when blocked. I am very pleased with the way the flower design has turned out. Arenda, have you tried this Japanese bookstore? They might be able to order your book for you.